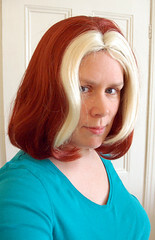 …that’s kind of a decent Rogue wig. Of course, now I’m going to have to make a costume (in, you know, my copious free time), because it’s one thing to wear my hair like that and something else to actually spend money on a wig. I wonder, would it be too short for the 'Farah Fawcett' head-banded Rogue look? I've never seen anybody successfully do the headband look on a cosplay for Rogue. I think it requires either real hair or a hugely expensive wig (or Jim Lee following you around re-drawing your hair all day). The same can be said of all 80's hairstyles. So all in all, that is a pretty darned cool wig for the straight haired Rogue look... but, which costume will accompany it? Good wig, no more bleach worries! OMG you look like the Bride of Brie Van de Camp.